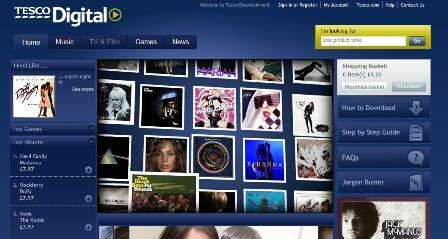 Tesco’s iTunes competitor – how does it shape up? This week sees the launch of Tesco Digital, the supermarket giant’s answer to iTunes. We’ve taken a look at the new site to see how it compares with Apple’s all-conquering download store, which has accounted for around 70% of worldwide online digital music sales. Apple’s iTunes store has more than 6m songs available for download, and Tesco is unable to match this, though it has launched with an impressive 3m tracks. However, only 1.6m of these are mp3 files that are compatible with iPods, so it cannot compete with the range of music available on the iTunes Store at the moment. Tesco has said that it will have all 3m of its tracks on mp3 by the end of the year though, as well as downloads of TV, films and games. The latest albums on Tesco are priced at £7.97 each, with individual tracks priced at 79p, while some older albums are available at £4.97, so no big difference from the iTunes store. The Tesco site is easy to use and navigate around, though I’m not sure about the use of Flash to display some of the latest albums on the homepage. Flash issues aside, it’s simple enough to find the music you want. The latest album and single releases are listed on the page and easy to find, while users can choose to search by artist or song title, or browse by genre. The browsing works a little better than iTunes, even though Apple’s store offers a wider range of genres and sub-genres. You won’t be able to search for German folk or death metal on Tesco Digital, but you can with Apple. Tesco Digital’s customers will first have to install the Tesco Download Manager before making a purchase, but this took less than a minute for me, so no great problem there. The site does at least list the benefits of registering, such as the ability to add items to your basket and save them for future visits, double clubcard points, and so on. Tesco Digital cannot match the sheer volume of tracks available with iTunes at the moment, but it has created an impressive and usable site with a decent range of music on offer. Offering iPod compatible tracks is a good move, and the site may become more of a competitor to iTunes once it has more mp3 tracks available, as it doesn’t beast iTunes at the moment on price or range of music. Apple’s download store now has other competitors offering DRM-free downloads, which Tesco doesn’t. Amazon recently launched its download site outside the UK, with 2m tracks available, while MySpace Music could become a serious contender. Local online advertising in the US is set to increase by almost a third on last year, according to a new report. Borrell Associates’ What Local Media Web Sites Earn: 2007 Survey, which polled over 2,800 local media sites, showed the market is forecast to reach $7.5bn this year. Yahoo! has bought Rivals.com, a US site for fans of college and high school sport, for a reported $100m. It’s the first acquisition since CEO Terry Semel stepped down from his post this week to be replaced by Jerry Yang. Embedding Flash content into a web page seems simple and in theory, it is. But if you’re using embed/object tags alone to embed Flash content, potential issues lurk under the surface.